Accessories: Accompanied by Rolex guarantee August 25, 2003, numbered sales tag, product literature, original sales tag and green presentation box. 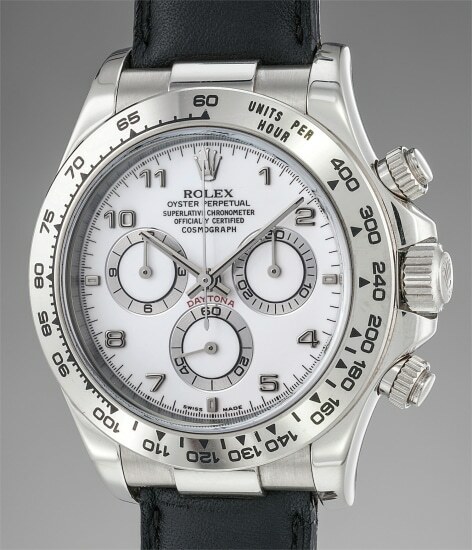 Offered in unpolished condition with its Rolex sticker still intact, this Cosmograph Daytona is cased in white gold, adding a luxurious twist to the iconic sports model. It houses the caliber 4130, which was Rolex's very first in-house automatic movement. In contrast, its predecessor, reference 16519 was powered by the Zenith caliber 4030. The watch is offered with its all original accessories such as the numbered sales tag, guarantee stating the watch was retailed at Georg Kittel, Aurich, product literature and presentation box.